Why blend in when you can stand out? 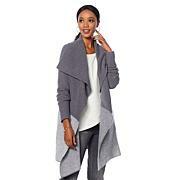 The right clothes help you do that, like this ultra-soft sweater with an asymmetric hemline. 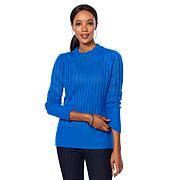 The back is cut at a diagonal and the sweep highlighted by ribbed knit to match the neck and cuffs. I am a size small and the small fits with room to spare. The green is a very pretty shade and looks just like it is shown. It is very pretty and stylish in person. So comfortable, soft and warm!! This has become my favorite sweater! 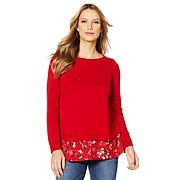 The fabric is soft and warm, the asymmetric design is flattering and turtle neck is such a perfect design too. HIGHLY RECOMMEND YOU BUY ONE TOO!! LOVE IT !!! Very soft, Got the XL, could have used the L, but the XL is just fine in the black, Perfect. Thinking about ordering another color and will probably order an XL again.